Alli and Sydnee Runyon handmade tie-knot blankets for the foster children at Necco. HUNTINGTON — Two young ladies recently provided foster children with handmade tie-knot blankets of their very own. Allivia Runyon, senior at River Valley High School (RVHS) in Bidwell, Ohio, shared she and her sister Sydnee Runyon, sophomore at RVHS, wanted to give back to their community and so decided to make a special item for foster children being placed into new foster homes. Alli said she and Sydnee have received tie-knot blankets from their family every Christmas for years and both always enjoyed being given a gift of their own, a gift of comfort. She explained she and sister felt by making tie-knot blankets for foster children, those children would get to experience that same feeling. Alli commented when the children are placed within in their new foster homes, they typically do not have many items of their to bring with them. Taking this project on as a duo, Alli and Sydnee have provided 15 tie-knot blankets to foster children so far. Alli commented she and her sister are currently working on more tie-knot blankets and will do their best to keep this project ongoing. Alli shared this is the first community project she has done with the NECCO organization, which, according to it’s website, is an organization that has been designed to “lift children out of an impossible situation and into a world filled with hope.” Across West Virginia, Ohio, Kentucky, Georgia thousands of children have been placed in supporting and caring families ranging from a variety of backgrounds and walks of life through the NECCO organization. The NECCO organization provides foster families with the resources, education, and support services needed to change the outcomes of children in need. Alli and her sister are active members of their community, both being members of Andrea’s Army and members of Raccoon Valley livestock club. Alli shared in the past she also organized a fundraiser “Cartwheels for Cancer” and raised over $500 for Holzer’s Cancer Center. Some background information on NECCO was provided from https://www.necco.org. 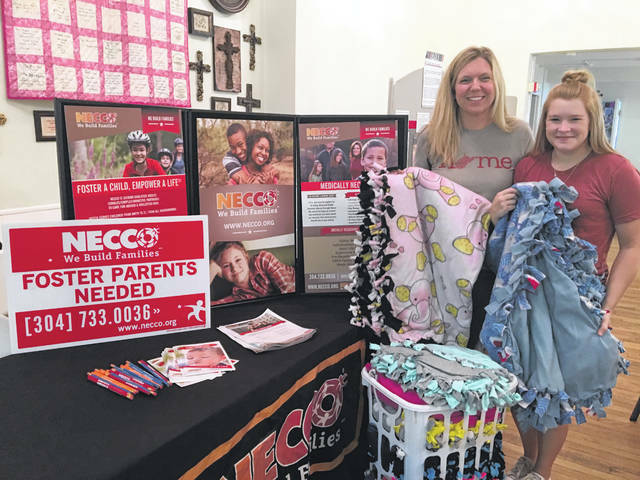 https://www.mydailyregister.com/wp-content/uploads/sites/24/2018/08/web1_0829.Necco_.jpgAlli and Sydnee Runyon handmade tie-knot blankets for the foster children at Necco.